At the national level, support is dropping. 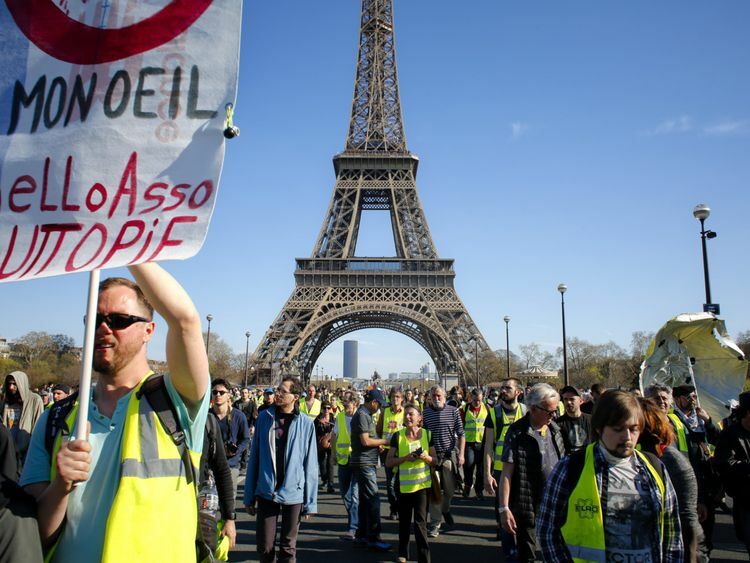 More than half of French people now say they want the gilets jaunes — the yellow-jacketed protesters with a record of violence — to stop their demonstrations. An even bigger majority — more than two-thirds — agree that the protesters who still block traffic circles and march through Paris every weekend are not the same people, with the same motivations, who began the protests last fall. To many, it looks as though the movement that began as a provincial revolt against gasoline taxes has become a home for political extremists of the far left and the far right, some of whom have used the demonstrations as an excuse to battle one another. The gilets jaunes have also become known, especially in Paris, for attacks on shops, small businesses and even kiosks, targets that hardly seem to merit the “anti-elite” rhetoric of the protests. It may be that the movement has peaked, at least temporarily: Some 40,000 people demonstrating, across France, last weekend do not imply vast support. But in its wake, the gilets jaunes have created a major dilemma for anyone who believes that politics should be about policies — taxes, spending, health care, roads — and not emotions. From the beginning, the movement found it hard to articulate what, exactly, it opposed. At first it was the gasoline tax, but protests continued after that was lifted. Later, protesters told journalists, or anyone who asked, that they felt discriminated against because they paid taxes but, because they lived in the provinces, received no social services. The Economist also noted, in response to protesters’ complaints that they pay high taxes and receive nothing in return, that “France has excellent infrastructure, (mostly) free education and first-rate health care that comes at little direct cost to patients.” Somehow, it seems that all these things have come to be taken for granted. Americans may look on with envy, but free health care, in France, is so humdrum that no one counts it as a benefit at all. The puzzle doesn’t end there. Like many other places, France does have big gaps between the rich and the poor. But unlike the United States or Britain, the French system makes major efforts to address inequality. In fact, France already has the most redistributive welfare system in Europe. To put it differently, more money flows from rich to poor in France than it does even in Sweden. Yet this fact is also either unknown or unappreciated. This could be because the French president, Emmanuel Macron, started his term by lifting a “wealth tax” on the very rich, on the grounds that it was driving entrepreneurs out of the country — a decision that drew attention to the top 1 per cent and caused a great deal of resentment. It could be because the flows are still insufficient. But it could also reflect a deeper problem, one that is not peculiar to France. A recent survey by the Organisation for Economic Cooperation and Development, a kind of rich countries’ club, showed that many people in the world’s wealthiest countries share a similar type of dissatisfaction. To quote the report, many Europeans in particular are “living safer, healthier, and longer lives, and are better educated than ever before.” And yet the people affected don’t perceive it that way. Instead, even those who have better access to doctors and teachers than their parents complain much more vociferously than did their parents about the inadequacy of public services. The wealthy think the poor benefit, and vice versa. The saga of the gilets jaunes suggests that perceptions of policy are sometimes more important than policy — or, perhaps, that perceptions are nowadays moulded by other things. Macron’s perceived contempt for the poor may be a more important source of discontent than high taxes. The low status of nurses and teachers might make people feel, legitimately, that these professions are not valued. The images of wealth and privilege that bombard all of us on Instagram and Facebook might be as important a source of social resentment as the realities of inequality, even in places where it is shrinking. But the discontent with the state and with benefits, wherever it is coming from, is real — and until it is better understood it will remain a political problem, in France and beyond. Anne Applebaum is a Pulitzer Prize winning American journalist, historian and author.